What about maple syrup? It's the blood of a tree, AND it'll give you diabetes if you consume enough of it. I used to have a crush on Stephen Harper. 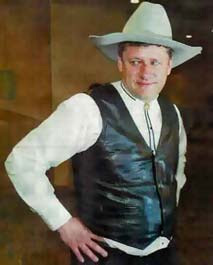 Even though I think he's a crappy Prime Minister, he still looks good in leather chaps! For some reason, whenever I see that picture, I can't stop singing "YMCA."